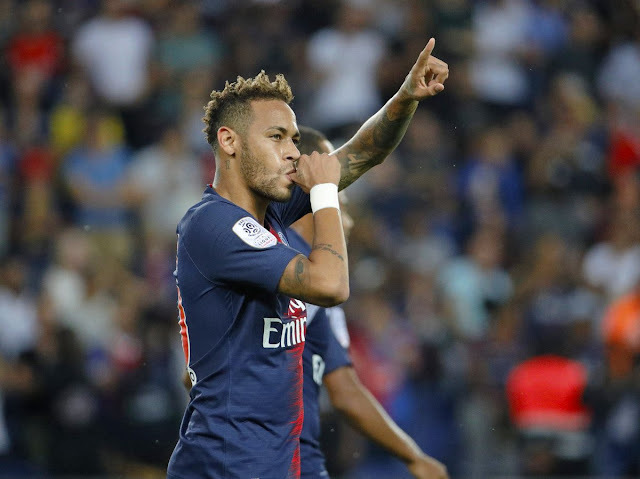 PSG star Neymar celebrates scoring against Caen during a French Ligue 1 match. Neymar scored the first goal as Paris St-Germain kicked off their Ligue 1 title defense with a resounding 3-0 win over Caen. The Brazil star who had a poor World cup display took just 10minutes before taking advantage of a mistake by Caen keeper Brice Samba. Adrien Rabiot made it 2-0 with a tap-in after Angel Di Maria provided the assist. German manager Tuchel was without his World Cup winners which includes Kylian Mbappe. Juventus and Italy legend Gianluigi Buffon made a spectacular save in his debut at 40, he showed sharp reflexes to prevent Thiago Silva from scoring an incredible own goal.